NCI Director Ned Sharpless addresses the NCORP Annual Meeting in Bethesda, Maryland. 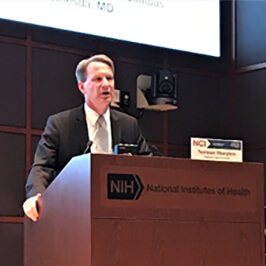 Self-described “big fan” of the NCI Community Oncology Research Program (NCORP), NCI Director Norman (Ned) Sharpless, MD, welcomed investigators and administrators from the program to their annual meeting in late September in Bethesda, Maryland. “I’ve only been at this job for about a year, but I’m already a big fan of NCORP and I’m invested in its success,” he said. NCORP investigators and research administrators met to discuss new ideas, measure successes, and make plans for the year to come. Dr. Sharpless said he appreciated the work they do to bring clinical trials and care to communities across the country. On clinical trials, NCI is committed to helping with novel designs and funding, including an increase in NCORP funding. The majority of patients are treated locally, so “NCORP is a way whereby we can provide great care and clinical research to patients we wouldn’t be able to reach otherwise,” he said. Dr. Sharpless also said it is time for NCI to invest more in large datasets. He points out that no matter what interests a particular cancer researcher, the aggregation of big data is going to help, particularly when the diseases are so heterogeneous. NCI needs to focus on a variety of efforts related to big data, including setting standards, encouraging interoperability among data sets, and annotation of genomics projects. NCORP Director Worta McCaskill-Stevens, MD, MS, told the annual meeting attendees that a hallmark of activities within the NCORP portfolio is academic-community collaboration. She noted the program is growing and has 960 component and subcomponent sites. Among NCI initiatives are the NAVIGATE program, developed to improve research access for veterans, in which two Veterans Administration hospitals are components of NCORP; the Early Onset Malignancy Initiative in six cancers; and a tissue procurement initiative for the study of tumor sensitivity and resistance in advanced cancers. NCORP continues to increase accrual overall to clinical trials for prevention, symptom science, comparative effectiveness, screening and tissue acquisition studies, she said. Significant efforts to reinvigorate cancer prevention are being made, Dr. McCaskill-Stevens said, including the Tomosynthesis Mammographic Imaging Screening Trial (TMIST) to study standard 2D vs 3D tomosynthesis. In addition, a new Cancer Prevention Clinical Trials Network (CP-CTNet) will replace the NCI Division of Cancer Prevention’s (DCP) contract-funded Phase 0-I-II Prevention Clinical Trials Program (Consortia), and will make it easier to launch trials, she noted. CP-CTNet will perform early phase clinical trials to assess the safety, tolerability, and cancer preventive potential of agents and interventions of varying classes. NCORP also is helping to enroll 4,000 patients to the New-Onset Diabetes (NOD) Cohort Study with DCP’s Early Detection Research Network, the National Institute of Diabetes and Digestive and Kidney Diseases (NIDDK) and the Pancreatic Cancer Detection Consortium. NOD may be a prelude to pancreatic cancer. The goals are to identify and follow a large cohort; develop a biorepository; clinically validate promising biomarkers of pancreatic ductal adenocarcinoma (PDAC); and develop an early detection protocol for sporadic PDAC. Ann Geiger, PhD, MPH, NCORP Lead Scientist for Cancer Care Delivery Research (CCDR), told the meeting that NCORP is the ideal laboratory for CCDR. Intervention studies are important to improving clinical outcomes and patient well-being, she said. Moving forward, desirable CCDR studies will undertake one or more efforts to: identify modifiable factors at the clinician and organization level that can be the target of interventions to improve care delivery; conduct pragmatic trials to assess the efficacy of interventions aimed at improving evidence-based clinical practice; test the effectiveness in community settings of interventions shown to be efficacious in academic settings; and assess facilitators of and barriers to implementation and de-implementation of effective interventions in community settings. Understanding and addressing health disparities will continue to be a focus over the next couple of years through individual studies and the inclusion of disparities-related aims in studies with a broader focus, Dr. Geiger said. Populations of specific interest include adolescents and young adults, the elderly, racial and ethnic minorities, sexual and gender minorities, and rural residents. Two keynote speakers addressed the meeting: Lawrence Einhorn, MD, an expert in clinical trials and supportive care and the clinical development of new drug therapies, discussed the toxicity of testicular cancer, for which he developed a cure; and Ana Marie Lopez, MD, MPH, FACP, current president of the American College of Physicians, and an experienced researcher in oncology, telemedicine, and patient-centered care, discussed the transitions, partnerships, and collaborations involved in maximizing cancer survivorship.